When things go wrong with your ArcPad project, the first thing to check is that your using the most current software and firmware. Below is a list of all ArcPad related releases. FYI - We plan on posting updates of this list (for regular reference). 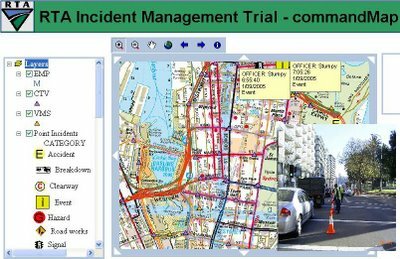 After a series of statewide trials the Road Traffic Authority of New South Wales in Australia has installed the CommandMap system for real time incident reporting. The rollout by RIA MobileGIS is the latest of a string of organisations that have been testing this technology using Telstra, the national telco service. Please send your ArcPad story to us at arcpadblog@maptel.com.au to showcase here. 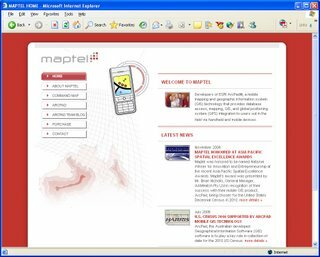 Maptel’s new website went live yesterday evening. Maptel was honored to be named National Winner for Innovation and Entrepreneurship at the recent Asia Pacific Spatial Excellence Awards. 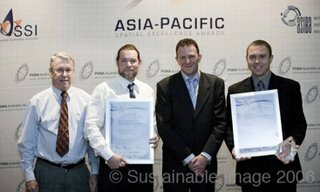 Maptel’s award was presented by Mr. Brian Nicholls, General Manager, AAMHatch Pty Ltd in recognition of their success with their mobile GIS product, ArcPad®, being chosen for the United States Decennial Census in 2010. The US Census Bureau has appointed Harris Corporation of Florida as the system integrator and prime contractor to develop and implement an automated system for field data collection. Harris will use the ArcPad mobile GIS platform supplied by ESRI Inc. to enable the field personnel to capture and record data in near real time. Known as the FDCA program the system will support upto 500,000 field 'enumerators' who will follow up and collect survey data from households that do not return their census forms.